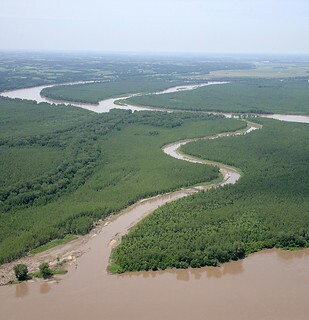 "Mitigating for Lost Habitat on the Missouri River"
Over the past 100 hundred years the Missouri River has been highly altered which has resulted in the loss of naturally occurring side-channel chutes. In the late `90s and early 2000s the US Army Corps of Engineers started to mitigate for these losses by reconstructing chutes. Since then our knowledge of how to build chutes, how they are developing and the fish response has increased. Currently more mitigation efforts are slated to take place each year and research continues. Kasey Whiteman is a biologist with the Mo. Dept. of Conservation studying reptiles, amphibians and fish of the Missouri River. He'll bring that unique on-the-river perspective to a look at how the habitat mitigation project is evolving. Take exit 2D towards Main St. Merge onto W. 6th St. Turn left onto Walnut St. Hickok's Grill will be on your left. Take I-70 into downtown Kansas City. Take exit 2F toward Grand St./Walnut St./Oak St.
Keep left at the fork and merge onto E Independence Ave. Turn right onto Walnut St. Hickok's Grill will be on your left. is hosted by Friends of Lakeside Nature Center, Little Blue River Watershed Coalition, Missouri River Relief, Friends of Big Muddy and Healthy Rivers Partnership with the following list of partners. All speakers are presenting for free. Thank you for sharing your knowledge with all of us! The Big Muddy Speaker Series is also held in Rocheport.